Castle Combe was voted ‘pretties village in England’ in 1961 and it is easy to see why. The Romans are known to have but a fort named ‘Castle Hill’ here due to its proximity to the Fosse Way, which required fonts all along its length for defense. The invading Roman army were quickly forced to move north and left Castle Hill as a mere posting station. In fact the ghost of a Roman solider left behind form this time is said to guard the Roman Bridge at the bottom end of the village. After the Romans left the Angles, Jutes and Saxons swept all over England and the Saxons were quick to move into the ready made fort at Castle Hill. After the Saxons took control of the area with victory in the Battle of Dryham there followed a peaceful period of around 300 years and saxon farmers create the village of “Cumbe” or Combe meaning valley. After the Norman Invasion of 1066, William the Conqueror bestowed the “Manor of Combe” to his loyal follower, Humphrey de L’isle and the village of Combe was later recorded for the first time in the Domesday book in 1086. in the early 12th century the Manor of Combe passed to Reginald de Dunstanville, who later built the Norman Castle on Castle Hill with the village becoming known as Castle Combe from then on. Reginald was also promoted to the Baron of Combe and three generations of Dunstanvilles lived in the castle until 1273. The castle fell into a state of disrepair in the 14th century and so a new manor house was built, now a luxury hotel. The medieval era was a time of prosperity in Castle Combe brought on by the success of the wool industry in England with Castle Combe having all the factors needed to establish itself as one of the most important villages for the production of wool at that time. Red and White ‘Castle Combe’ cloth was sold at markets all over the country. As Castle Combe grew it was granted permission to hold a weekly market by Henry VI in 1440. 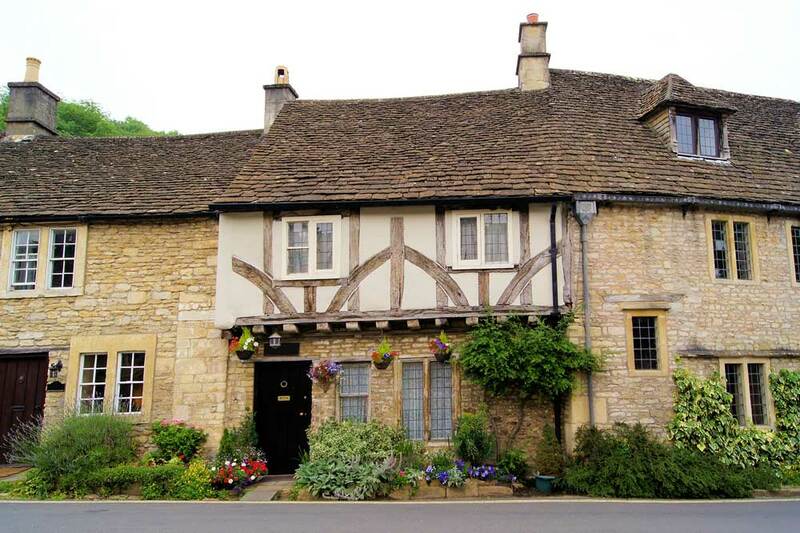 The pretty Weaver’s Cottage in Castle Combe housed the villages weavers (spinners) in the 15th century and were used to produce the Red and White ‘Castle Combe’ cloth used for soldiers uniforms amongst other things. Wool would be bought at market in places such as Tetbury or Cirencester , often funded by a wealthy cloth merchant who washed, dried and oiled the wool before giving it to the weavers of Castle Combe to spin into cloth. The weavers, seen as great craftsmen (and women) enjoyed high status in the village and got a prime piece of real estate by the river, due to their need for water during the Fulling process. The Weavers House- once the home to the Blanket brothers is also said to be the birthplace of the blanket! The origins of the Church date back as far as the 12th century, although work on the huge 80ft clock tower supposedly began in 1435. The church at Castle Combe is a wool church in the first tradition paid for by the local wool merchants and £4000 donated by Sir John Falstolf, former Lord of the Manor and immortalised by Shakespeare as Sir John Falstoff in Henry IV. Why not visit Castle Combe and other pretty Cotswold villages on one of our driver-guide or cycling Tours of the Cotswolds?